The LCIC-1106A has been discontinued. Please see the INET-400 Series as a possible alternative or contact our Data Acquisition Engineering Department. 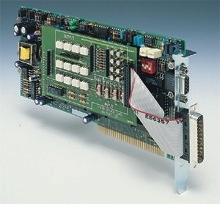 The LCIC 1106A is a load-cell interface card for the IBM PC/AT and compatible computers. It will accept any type of strain gage based load cell. Each card can read one load measurement. The card will directly power up to six 350Ohm load cells wired in parallel. In fact, it is a completely stand-alone sophisticated weighing indicator with 16 bit internal resolution and very fast A/D conversion rate. Direct communication with the PC’s bus and high frequency sampling enable the LCIC-1106A to handle real time applications impossible with external indicators via serial communication. The stand-alone microcomputer based interface card, requires no other interfacing accessories, simply connect the load cell directly to the card and you are ready for calibration.